Now that you have chosen your boat, we suggest you peruse the list below of additional equipment. This list makes no claim to completeness. We strongly recommend that you obtain and maintain sufficient equipment to allow you to paddle with the greatest possible safety margin. We strongly recommend that you seek qualified paddling instruction and constantly practice what you learn. Kayaking is an excellent activity for people of all shapes and sizes! Please paddle responsibly, only you are responsible for yourself. 1 - Items of Pouch equipment, which you can add to the Basic Package of the boat of your choice. Some of these items may already be included in the current Basic Package for the E68 single or the RZ96 double. 2 - Items of folding boat equipment that we do not (currently) sell, but that you may wish to consider nonetheless for comfort or convenience. 3 - A brief mention of safety items, intended merely to point out that this type of equipment exists and that you should research it further. Any water sport is potentially hazardous, due to the inherent risks of cold shock, hypothermia, drowning, collision, injury and others ... we therefore strongly recommend that you obtain and maintain sufficient equipment to allow you to paddle with the greatest possible safety margin. Furthermore, we strongly recommend that you seek qualified paddling instruction and constantly practice what you learn. Kayaking is an excellent activity for people of all shapes, sizes, ages and levels of experience! Only you are responsible for yourself, please enjoy your paddling responsibly. The backpack holds skin and longitudinal frame pieces of either the E68 single or the RZ96 double. It also contains the frames of the E68 single. The Backpack has padded shoulder straps, a waist strap, and drawstring top closure with storm flap. We recommend this bag to carry the frames, rudder components and spraydeck of the RZ96 double (it is included in the Basic Package of the RZ96 double for this reason). Four Fastex-type buckles connect it to the Backpack to create one solid piece of luggage or the bag may be carried by an integral handle on its side. The components of the E68 single all fit into the Backpack. Nonetheless, the E68 Backpack is also factory equipped with the buckles needed to connect the Additional Gear Bag to it. It is a convenient way to carry PFDs and other gear. The E68 single tracks and turns well without a rudder. However, since the stern fitting and the deck tubes for the rudder cables are easiest to install at the factory and since we consider the heel plates worth having anyway, we include it in the basic package. Use of the rudder makes paddling less demanding on the skills of the paddler, especially when the boat is heavily laden. Paddling double kayaks without a rudder is certainly possible, but somewhat less than convenient ... of course we include a rudder as part of the basic package of the RZ96. Both run through webbing loops and D-rings, which are sewn to the deck (with reinforcement patches on the underside of the deck material) and spaced parallel to the sheer. The loop line allows another paddler or a swimmer to hold onto the boat, it also provides convenient attachment points for gear anywhere along the length of the hull. The elastic rigging on the fore- and /or aft-deck allows quick belaying of paddles and other equipment, which you only need to push under it. This seat is designed to fit over the keelson assemblies of the E68 single and the RZ96 double (as well as very comfortably under the paddlers). It has flanges that hold it in position laterally, but allow adjustment forward and aft. The top of the seat is shaped to conform to the buttocks in such a way as to compress the muscles slightly for additional padding to ensure that the paddler's weight is not resting on the pelvic or tail bones. c) an outer fabric hatch cover, which fits over the plywood ring with an elasticized rim; it adds security to the roll-top closure of the hatch system against any potential snagging and also presents a first barrier to water ingress. Pouch boat skins are tough. Due to the elasticity of the hull material, is is unlikely to get punctured except under severe circumstances. However, when the hull material is trapped between a relatively unyielding (longitudinal) frame member and a hard abrasive surface and subjected to movement, damage is possible. The strips provide a sacrificial reinforcement, preventing damage to the hull material itself. If you expect to experience frequent grounding on aggressively abrasive surfaces, a pair of strips running the length of the keelsons is worth considering. If you expect to find yourself in adverse and partially uncontrollable circumstances, then consider an additional pair of strips along the run of the stringers. The rig consists of jib and high aspect ratio fully battened, loose-headed main sail (5 sq-m, approx. 54 sq-ft, in total). It includes leeboards on a yoke and a helmsman's control board with mainsheet block and jam cleats. This rig turns the RZ96 into a very capable sailboat with good upwind ability. The loose-headed mainsail takes on an increasing twist in response to gusts and stronger winds, yet remains highly efficient due to the battens. The less potential for ingress of water there is in a boat, the more potentially seaworthy it is. 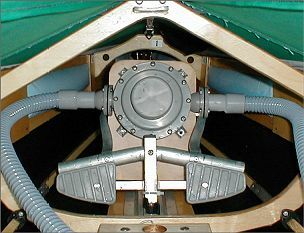 The Pouch spray deck completely covers the open cockpit of the RZ96 and is attached to the outside of the washboards by the same star grip nuts that secure the washboards to the tops of the frames. There are funnels at each paddling position, slit on one side to permit easy entry and egress for the paddlers, as well as providing fully adjustable ventilation when conditions permit. The slits close very effectively with hook-and-loop straps. This is an important safety item. It stops water ingress and helps to keep the paddler warm and dry. We recommend the HIKO T4 model, which consists of a neoprene deck with a heavy-duty bungee rim and a diagonal ripcord. The Nylon funnel has a mesh drained front pocket, elastic drawstring and adjustable elastic suspenders. The bags are shaped to fit into the ends of the hull, with inflation tubes sufficiently long to reach the cockpit. They provide floatation (in addition to the sponsons, which are standard in both the E68 single and the RZ96 double). 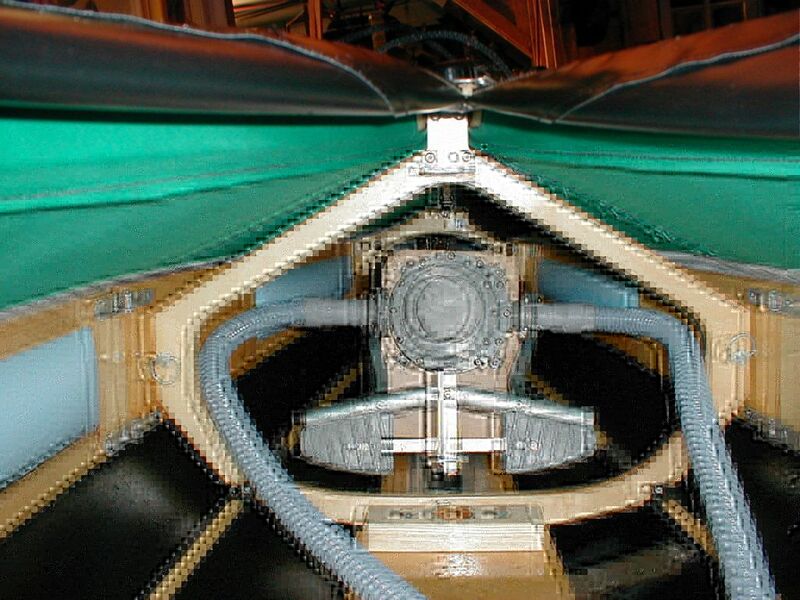 They also fill out the extreme bow and stern sections of the frame, preventing water from pooling in the ends of a partially flooded hull and thus reduce the adverse affect of such water on the directional stability and the resulting increased tendency of the boat to broach. We recommend the beautifully finished Bending Branches "Journey" model. The fiberglass ferrules are reliable, hardwearing and specifically matched for each paddle for left- and right-handed feathered, as well as unfeathered paddling. The shaft is of a sufficiently large diameter for a comfortable grip and somewhat ovalized where you hold it. It tapers to the inner diameter of the ferrules without a hard shoulder, which could otherwise provide the starting point for cracking. We particularly like the narrow, high aspect ratio blades, which permit a broad range of paddling styles and excellent control. These paddles fit into the Pouch backpack. You can carry Pouch folding boats on your back when they are folded; the Pouch backpacks are designed to allow you to do so. However, for longer distances it is more comfortable to put either the assembled or the packed boat onto a collapsible cart, especially when you wish to move your additional camping and other gear at the same time. We recommend PaddleBoy carts because of their solid yet light-weight construction and the ease with which they can be used and packed up in the boat. The central rudder track and pedestal system in Pouch boats allows the use of a foot-operated bilge pump. In the event that you find yourself in a flooded boat, a foot operated pump lets you use your strong leg muscles to perform the hard work of putting the water back where it should be without forcing you to compromise the integrity of the hull by sticking a hand operated pump through the spray skirt / deck. This set-up also leaves your upper body and arms free to control the boat, surely useful if the circumstances were adverse enough to cause flooding in the first place. We recommend that you always where a PFD designed for paddling and displaying the US Coast Guard approval label. A PFD must fit you well, we therefore recommend that you try on and, if possible try out, a number of them under expert guidance at a small craft shop or an outfitter. Going into the details of further available and / or desirable safety equipment goes beyond the scope of this list. Expert advice on flares, lights, strobes, paddle floats, re-entry slings, throw ropes, towing systems, compasses, maps, GPS etc. is freely available from manufacturers, small craft shops, outfitters and, of course, on the internet. Home -- Different Boats -- Price & Ordering -- Meet Ralph Hoehn & the Associates!